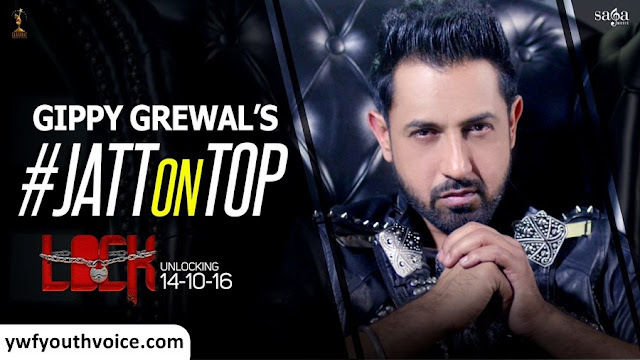 Jatt On Top - Gippy Grewal - Lock (2016) Watch HD Punjabi Song, Read Review, View Lyrics and Music Video Ratings. Latest Punjabi song 2016 "Jatt on Top" enjoy Gippy Grewal's first song from upcoming Punjabi movie "LOCK" a film by Smeep Kang, going to unlock the mystery on 14th October in your nearest cinemas. Music of the song is given by Jay K (Jassi Katyal) and lyrics by Dalvir Sarobad "Eho chandre black di ne dasde Meri mehntaa naal kitti hoyi kamai nu...Hath sirr utte rakhi mere maalka Lokk jarde naa Jatt di Charai nu"
Click here to listen latest songs of Gippy Grewal. Well written lyrics combined with classy beats is the soul of the music video, Gippy's voice makes sure that no extra effort need to be put in video. Lok jarrde na..jatt di chadayi nu..